​If I could describe Chika with one word it would be; KIND. Chika is Kind. And that was why I was not surprised when his reply to one of the questions was – Be Kind Always. To yourself and to others. In this interview, he talks about poetry and tells us to expect his poetry collection THIS YEAR!!! I enjoyed this Interview. I hope you do too! 1) THE AFRO READER: Hello Chika, thanks for granting us this interview. Tell us more about yourself. Chika Jones: I write non-fiction a lot, because I have come to learn that even our ordinary lives are thongs worth writing about. I love listening to performance poetry, I recently fell in love with Andrea Gibson’s work, before that it was Rudy Francisco and before that it was Sunni Patterson. I am shy, except when I am performing. 2) You recently organized a poetry show In Lagos with the theme AJIDE. RESURRECTION. What spurred it? What is the motivation behind it? I didn’t organize it. It was organized by Arts and Africa, an online literary magazine to announce their resurrection after a long hiatus. I was the headlining act at the event, where I performed four poems at a stretch, the longest I have ever done. 3) When did you realize that poetry was it? Can you describe the first time you felt you could really create? I wouldn’t say poetry is ‘it’. I would say I have worked on performance poetry a lot more because of its accessibility, both for me and fro the audience. December 2013, when I won the first ever poetry slam competition I competed in gave me kind of validity and pushed me to do more. 4) What is the message in your poetry and what are your readers reaction to it? I don’t think there is a general message. Each poem differs in its subject matter and style. However whatever I am performing at that specific moment, the audience reaction has largely been recognition, understanding, sometimes shock, especially for the inflammatory ones. 5) How has Lagos helped in shaping your creativity? I have lived in Lagos, practically all my life and the daily influences from the man on the street, to the daily hustle and bustle, the food we eat, the fights we see, the sounds that have become a soundtrack of our daily lives, all these form a basis for the language I use, the metaphors I deploy and the stories I tell. 6) Have you written about any town/city other than Lagos? Yes. The places I have visited have featured from time to time in my poems. I feel like when a place makes an impression, however fleeting, it shows up in a poem. I have a new poem, which shows Berlin, the Istanbul airport too. 7) What authors/poets are you friends with and how do they help you become a better writer/poet? 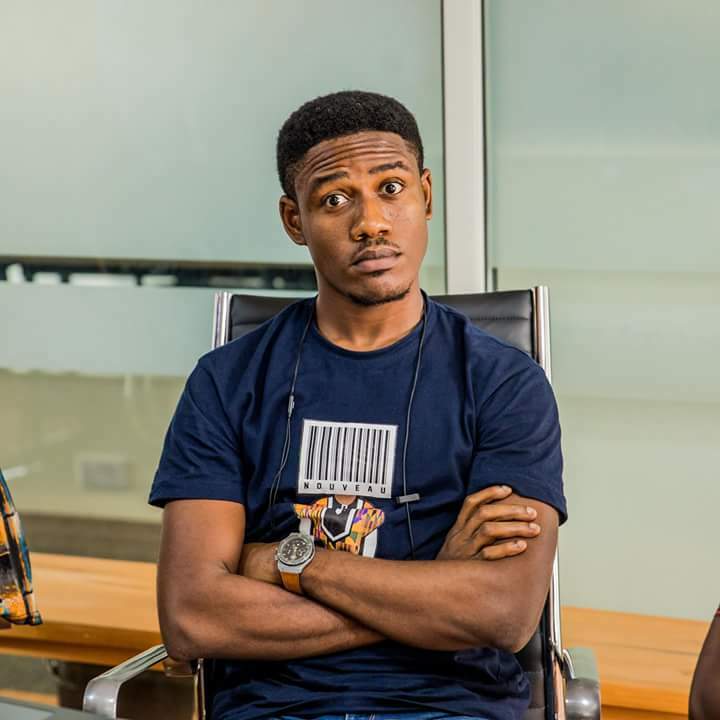 I do hope I am not presumptuous in calling them friends – Efe Paul Azino, Titilope Sonuga, Romeo Oriogun, Wana Udobang, Dami Ajayi, Soonest Nathaniel – I have learned everything from style and craft to stage presence and how to make important career decisions from them. From Ifeoluwa Nihinlola, I have learned kindness and honesty and a vital love for reading. 8) Who are some of your favourite poets? Andrea Gibson, Titilope Sonuga, Sunni Patterson, Warsan Shire, Romeo Oriogun, Efe Paul Azino, Rudyard Kipling, Kayo Chingonyi, Koleka Putuma and many others. 9) What influences your writing of poetry? And. What inspires you to write poetry? The need to tell stories and the fact that I might be good at using poetry to tell them. Stories are an integral part of our lives, our lives after all said and done are stories. 10) Do you view writing and your art in general as a kind of spiritual practice? I don’t think I understand how the word spiritual is used in this context, but if it is in matter relating to or affecting the human spirit or soul, then I would say yes, every for of art or literature is spiritual, they speak to the human spirit and shape it, sometimes in permanent ways. 11) All poets have several words that come up over and over again, words or sentences that reflects the theme of their poetry. What are THREE of your absolute few words? I don’t think I have such words. Unless when writing on a particular theme. Maybe the word ‘write’ because I am become increasingly obsessed with language and how it is used, how we pick the words we write with and how we choose to write. 12) What do you think about spoken word poetry and performing your poetry and how does it differ with just writing? Writing and performing are different things. They cater to different audiences. They are both important and you can choose to do either or both. Your page poems can be adapted for stage, sometimes with little or no alterations. If the question is whether any is less than the other, the answer is no, as long as it is well done. 13) Does writing energize or exhaust you? Energize? No. Exhaust, sometimes, especially when writing about a difficult subject either in length or subject matter. 14) Some of the struggles you face when you write? Writing well. I am not a very good writer, so it takes several rewrites before I either give up or get it right. 15) The general rule is that for you to be a great writer, you must be a greater reader. Growing up, what books did you read? And how did they shape your ability to tell stories? I read everything I could find. Mills and Boons, Harlequin romance, James Hadley Chase, Saul Bellow, Aesop’s fables, Chinua Achebe, Wole Soyinka. I think the wide, indiscriminate range imbued in me a love for stories and broadened my imagination. 16) Why do you write, what keeps you motivated during writing slumps? Most times, I have a story I really want to tell, or I have been commissioned to write something. I like the writing slumps as they give me time to do other stuff. 17) What does poetry mean to you? Poetry is beauty, bravery and trying to distill the cosmos into a couple of lines. 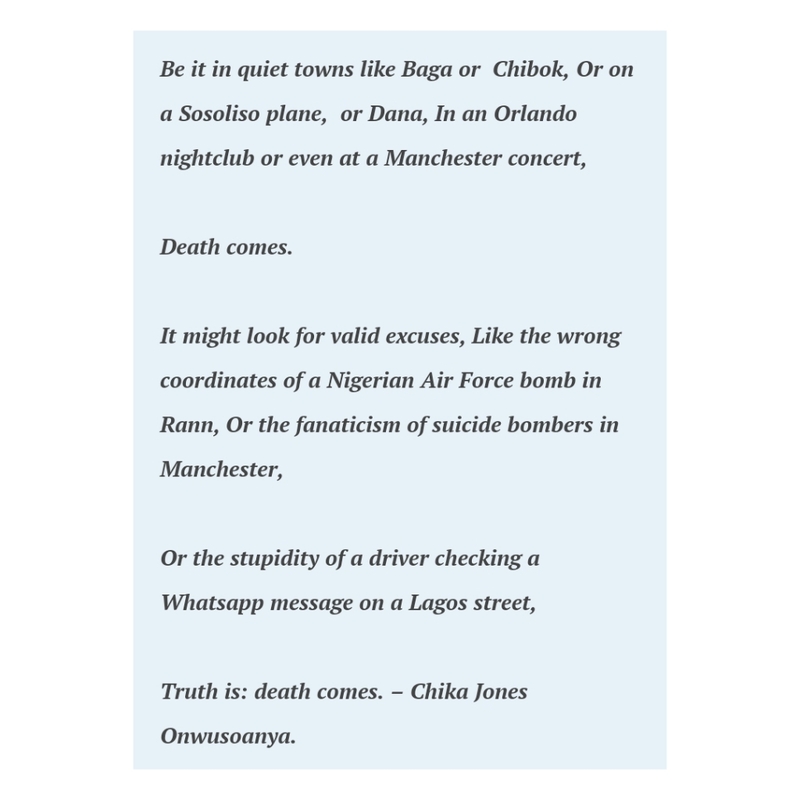 18) When are expecting your Poetry collection about Lagos? I am not sure. But in 2018, I hope. 19) How did Attending the Farafina workshop affect your writing life. What do you think about writing workshops in general? The Farafina workshop gave me some sort of validation. Also I discovered there my love for writing non-fiction and made friends who have become like family. I think writing workshops are important as long as you don’t expect them to teach you to write. You might learn a thing or two, but on the whole, it’s work you haven’t done yourself. 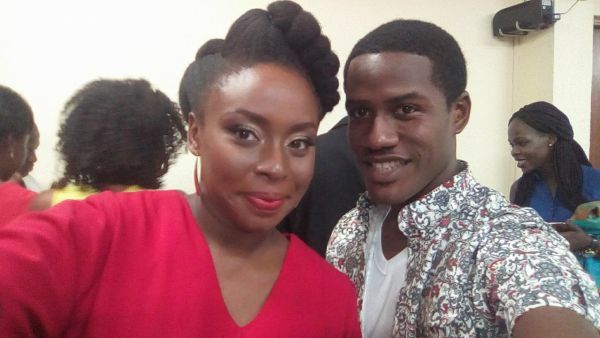 Chika Jones with Author, Chimamanda Ngozi Adichie. 20) What is the most liberating thought you have ever had? Liberating thought? Maybe realizing that all you really have to be is kind. ‘None of it really matters. There are infinite timelines and infinite possibilities’ – That’s a quote from Rick and Morty, my favorite cartoon. 22) What gives you joy? A good song. A good story. A good poem. By good, I mean great or beautiful. A year ago, the answer would have been failure. Now, the answer is nothing, really. 24) Advice to others and best advice you have gotten? Be kind in everything you do. To others and to yourself. 25) What book are you reading currently? I am stealing a read from ‘White Teeth’ by Zadie Smith, and the first few pages have me cackling wildly. I am half in love with it already. 26) Memoirs, Essays, Fiction, Poetry, Non-fiction. Which is a favourite? 27) Recommend five books you think everyone should read? ‘White Teeth’ by Zadie Smith (not done with it yet, but you should). 28) Packing for a journey and allowed to take one book, what will be? 29) Which genre do you enjoy writing best? Fiction or Poetry? 30) Describe African Poetry and Literature! African poetry is poetry written by Africans and it is awesome. There are several examples of such awesomeness. Literature means the ability to tell stories and preserve them. Chika loves well written stories and poetry that is so undeniably true. 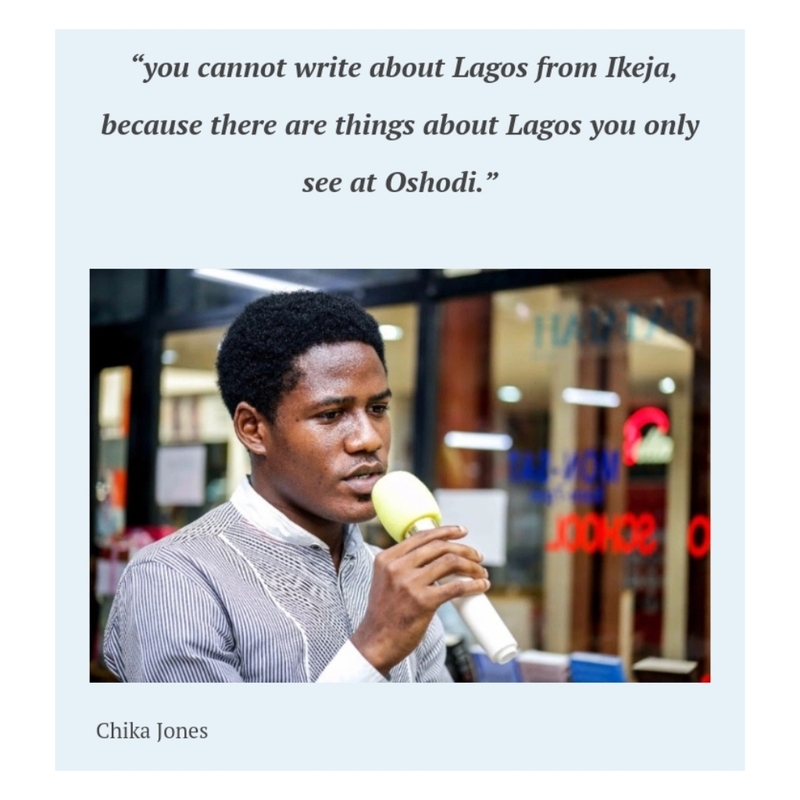 Visit Chika’s Website to enjoy the best of this poetry and short stories!